Product prices and availability are accurate as of 2019-04-19 07:17:17 UTC and are subject to change. Any price and availability information displayed on http://www.amazon.com/ at the time of purchase will apply to the purchase of this product. Heal is an herbal remedy designed to soothe, build and promote healing of the flesh, bones and cartilage. 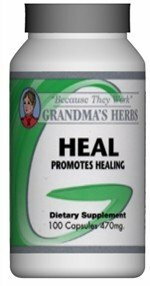 Many people have had great success using the supplement after surgery or injury to promote healing.Grandma's Herbs Heal SupplementQuantity: 100 capsulesPotency: 470 mgHerbal remedy for natural healing of bone, cartilage and fleshRecommended use: Four capsules four times a day for healing purposesIngredients: Heal all (herb), wheat grass (herb), horsetail grass (herb), slippery elm (bark), marshmallow (root), alfalfa (leaf), nettle (root), oat straw (herb), calendula (flower), oak (bark), plantain (leaf), yarrow (flower) The content on this site is not intended to substitute for the advice of a qualified physician, pharmacist, or other licensed health-care professional. The products may have additional information and instructions on or inside the packaging that you should carefully read and follow. Contact your health-care provider immediately if you suspect that you have a medical problem. The use of dietary supplements may not have been evaluated by the Food and Drug Administration and is not intended to diagnose, treat, cure, or prevent any disease or health condition.Due to the personal nature of this product we do not accept returns. Due to manufacturer packaging changes, product packaging may vary from image shown.